"Warrior's luck runs out, or worse. The case for a conspiracy." The Columbia Review. Readers who were fascinated, tickled, or outraged by the previous books in this series (Killing Lincoln, Killing Kennedy, and Killing Jesus) will find this new O’Reilly installment — Killing Patton — no less fascinating, tickling, or outraging. 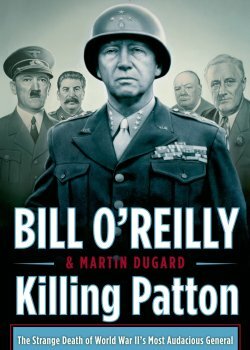 Killing Patton: The Strange Death of World War II’s Most Audacious General was written by Bill O’Reilly in partnership with Martin Dugard. O’Reilly is a leading public voice in the US as anchor of The O’Reilly Factor, the highest-rated cable news show in the country, as well as the author of a widely syndicated newspaper column. General George S. Patton, Jr., one of America’s more decorated military leaders, died shortly after his fame reached new heights with his decisive and well-photographed victory over the Nazis forces in Europe. Whether he did, or did not, aspire to a political future and elected office (as did his commander, General Dwight D. Eisenhower) Patton’s untimely demise in an odd car accident left many wondering about its true ‘accidental’ nature. But whether one believes in conspiracy, incompetency or fortuity, this book provides a lively and historically accurate picture of the dramatic last months of WWII and the events surrounding Patton’s anti-climactic death. The book leaves us with no doubt that many powerful players harbored an eager death wish for the crusty blunt General. But whether his enemies got lucky or got away with murder is a question this book presents with ample facts to support either conclusion. Hence, readers will enjoy Killing Patton as an excellent historical murder mystery, or as a well-told story of a great warrior whose luck ran out just as he was about to move on to fighting the next great war for his beloved nation.